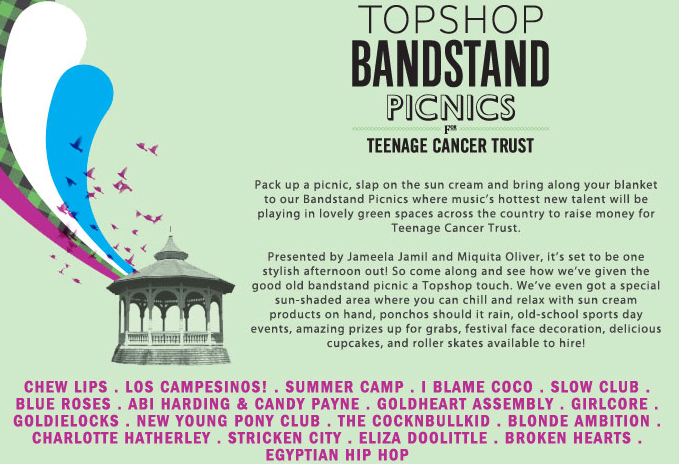 If you’re in Bristol this weekend, and looking for something to do, why not check out the Topshop Bandstand Picnic on Sunday? On the 13th June,Ã‚Â Castle Park Bandstand in Broadmead will be taken over by Topshop with sports day games, face painting, roller skates and a few bands. Performing at the event will beÃ‚Â Charlotte Hatherley, Chew Lips , Slow Club and Goldheart Assembly with proceeds going to Teenage Cancer Trust. Tickets are only Ã‚Â£10, so its worth a look! Alternatively, if you’re more of a Bath person, the new Topshop opens tomorrow at 1-11 Southgate. To celebrate the new store, they’re hiding lots of keys all around the city. 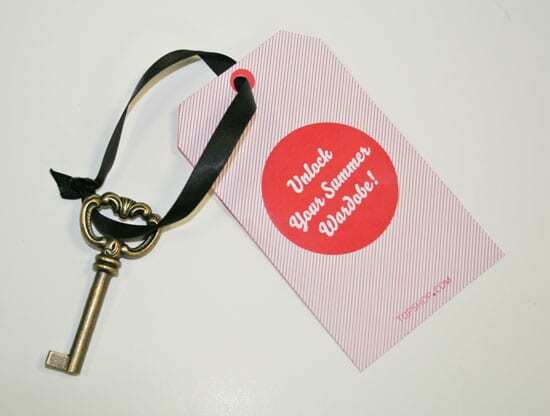 If you find a key, and it fits the wardrobe in the new store, you can win a “Summer Wardrobe” worth Ã‚Â£250. This competition is running from the 10th to the 13th June, so plenty of time to hunt around! Aw, man, what a line-up! I wish I was in Bristol on Sunday, or even in Bath tomorrow. I’ve only been to Bath once & never to Bristol! Sin. This weekend is packed with fun. It’s also Totterdown Music Festival, Bristol Festival of Nature _and_ the World Cup starts. No-one is allowed to be bored! .-= Kate´s last blog ..Do or die =-. So cute! I know that there is a Teenage cancer Trust gig on Sunday in Birmingham! .-= kirsty´s last blog ..Next Blogger Competition =-.